Jaded gamers often talk about an industry afflicted by sequlitis and an overall lack of originality. Ubisoft seems to have heard gamers loud and clear, releasing two new IPs in as many months. Can Watch Dogs live up to the hype it managed to generate? Yes. Yes it can. 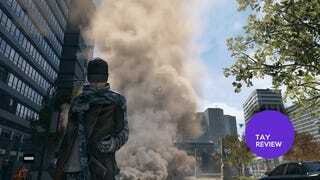 Watch Dogs is the story of Aiden Pearce, thief-turned-vigilante who uses the city's hyper-connected operation system, CTOS, to hack the city and turn Chicago upside-down. Of course, there are various types Aiden needs to defend himself from— rival hackers, mob bosses and of course, the police. Aiden's supporting cast is a motley crew comprised of fixers (hitmen) and hackers who help Aiden through his journey in Watch Dogs' Chicago. Aiden is joined by T-Bone, a backwoods punk hacker who loves to drink. Clara, a badass who always seems to be a step ahead of him. And last but not least, my personal favorite, Jordi a fixer who takes perhaps a bit too much pride in his work. One of Watch Dogs' opening scenes starts with Jordi trying to convince Aiden to see the deft hand he's applied in killing a few gang bangers as he slumps one against the wall, leaning against him as he makes the dead man fire a round into his comrade. Scenes like this add a sense of personality to the supporting cast that makes them interesting. Most missions will afford you the opportunity to make the choice to charge in guns blazing, or skulk around the area dropping lures before escaping quietly to create chaos with the help of hacked security cameras. Having the choice itself is extremely gratifying, and Watch Dogs does it quietly, which is something I appreciate. Shooting is satisfying in its own way as well, of course. Despite Stephen's disappointment with guns in Watch Dogs, they're very well done. Aiming is spot-on, and the control scheme will be instantly familiar to anyone who's played a third-person shooter in recent years. Of course, shooting is nothing without a decent cover system, and what's on offer here is probably the best cover-shooting experience I've had. In the middle of the action, Aiden can run between cover with a single button press. Environments are also littered with structures you can hack to create makeshift cover, though I never quite felt the need to make use of one. Watch Dogs may not look as good as its now-infamous E3 2012 trailer, but that doesn't mean it isn't a looker. Characters may not be as hyper-detailed as they were when we were first introduced to them, but they look amazing nonetheless. Even more so in real-time cutscenes. The city itself looks stunning under the veil of night with subtle lighting effects really highlighting the great work Ubisoft's various teams have done here. Explosions are absolutely gorgeous, raindrops fall individually and leave your jacket slick and subtly reflective and you can even see individual drops hit the sidewalk. Watch Dogs is rife with opportunities to find out more about Chicago's citizens, including some very interesting people. Perhaps the most interesting part of hacking, profiling reveals side missions, secondary objectives, bank accounts and general information of just about anyone in the city. This single element adds a layer of humanity to NPCs that is sorely lacking in so many sandbox games. In fact, a fellow TAY author genuinely regretted hacking as a byproduct of his profiling. I ignored digital trips for much of the game, thinking it wasn't much more than just some cheesy drug reference in an otherwise entertaining game. Boy, was I wrong. Yeah, digital trips are definitely a drug reference of sorts, but they're a vehicle to some truly interesting gameplay. My favorites were Psychedelic (pictured above) and Spider Tank. The former has you bouncing between neon flowers and flying through rings all over Chicago to rack up points; the latter has you taking control of what is essentially a robotic black widow of Godzilla-like proportions armed to the teeth with a chain gun and anti-tank gun. If you played a heroic route, you're able to sate your desire for wonton murder here, and to be honest, it's just plain fun. I often fear driving in sandbox titles. It's not that I'm a particularly bad driver, see, it's just, I find leveling up handling to be an annoying feat to need to accomplish, as with GTA. Fortunately for me, you don't need to improve your handling in Watch Dogs to drive competently. The problem, however, lies in the fact that cars just don't handle as well as I would expect them to. Cars handle reasonably well, but feel a tad floaty, as though the surface of the ground is constantly slick. The cars' arguably poor handling isn't too much of an issue most times, but when you're trying to chase down a criminal convoy or you have a mission that requires you to chase someone down in a vehicle, you might find yourself wishing you could just blow them away instead. Multiplayer in Watch Dogs' plays well with the single-player theme of constant connectivity. Other players can freely (you can turn this off if you like) hop in and out of your game, trying to hack you to steal data and gain points. Of course, you can hunt down and kill them to stop this, or use your gear to slow their progress as you search. It all sounds well and good, but I found essentially all modes aside from free roam to be a complete waste. Player-controlled fixers trying to hack me become old fast, as finding them was more annoying than I had patience for. Grabbing a few buddies and tooling around in the world though? Sheer delight. 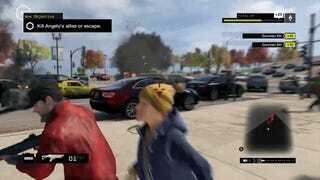 If Ubisoft were to create a GTA Online style multiplayer experience set in Watch Dogs' Chicago, I'd be thrilled. Unfortunately, as a package, multiplayer falls down a bit. I honestly found this to be completely baffling. Aiden is capable of tearing through the mean streets of Chicago wielding weapons of all type, from pistols to grenade launchers. You can take down helicopters, wipe out cars by the dozens and kill hundreds of mob foot soldiers, but you can't shoot out your car window? It just seems absurd, and counterintuitive . As in many sandbox games, you'll hear the vast majority of Watch Dogs' soundtrack while driving through town. Unfortunately, you'll end up turning your radio off the vast majority of the time, as the tracks are far too varied to consistently find something you'll enjoy listening to. Ubisoft tried taking a "something for everyone" approach with their songs it seems, and it just turned out as nothing for anyone. Watch Dogs is a fantastic start to an interesting new franchise. I can't help but be reminded of popular superhero movies after having thought on the game for a while. Like a good superhero flick, Watch Dogs' story doesn't feel like it's reached a conclusion, but more like it's explained the origin of a hero we'll be spending years to come with. With an opening like this, I can't wait to see what Aiden's second act will deliver.